Whether your family likes football, basketball, soccer, baseball, or anything else, you need some go-to recipes for tailgate parties. 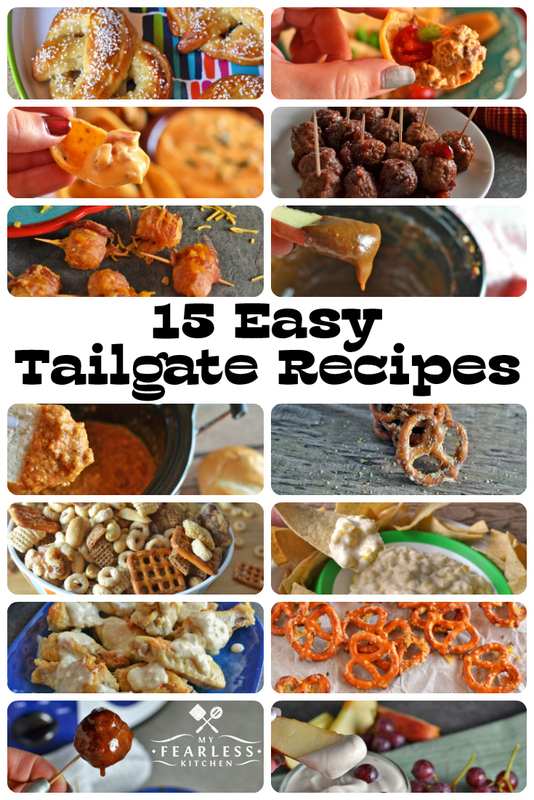 Every recipe in this list of 15 Easy Tailgate Recipes is a winner! No matter what your family’s favorite sport is, you definitely need a handful of go-to recipes for any tailgate party. I’ve got a great list for you here. No matter what you like, you will find the perfect recipe that your whole family will enjoy! If you like to snack all day, you will love these Garlic-Parmesan Pretzels, Easy Ranch Pretzels, and Slow Cooker Salty Party Mix. These Homemade Soft Pretzels are absolutely amazing, and perfect for every dip. Speaking of dips, there are so many options! My favorite is this Slow Cooker Cheesy Taco Dip. For comfort food on a chip, try this Slow Cooker Hot Ham & Cheese Dip. John’s favorites are the Spicy Sausage Dip and Pizza Fondue. If you’re dreaming of summer, try this Creamy Corn Dip with fresh or frozen corn. If you want something a little sweeter, you’ll want to try this Quick Vanilla Fruit Dip and this Slow Cooker Dulce de Leche Chocolate Dip. Sometimes these “snack sessions” turn into dinner, and that’s great! If you want something a little more substantial than chips and dips, you can’t go wrong with these Cheesy Bacon-Wrapped Tater Tots. If meatballs are your speed, these Slow Cooker Honey-BBQ Meatballs and Slow Cooker Cranberry Meatballs are so easy to make by starting with frozen meatballs. Looking for wings? You’ll love these easy Slow Cooker Garlic-Parmesan Wings. What’s your favorite thing about tailgating foods?